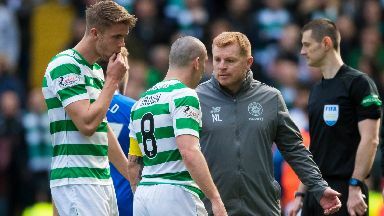 Celtic manager Neil Lennon has described an SFA charge facing his captain Scott Brown as "trumped up". He also took a swipe at Steven Gerrard after the Rangers manager insisted Ryan Kent's lashing out at Brown was not violent. Lennon said: "The only rational thing Steven Gerrard has said this week is that they played the best team in the country on Sunday." Brown has been accused of breaching a rule which states players must act in the best interests of football. It is understood the charge does not relate to the on-field melee following Celtic's 2-1 win over Rangers last Sunday. After the final whistle, the midfielder was seen gesturing towards visiting Rangers fans. 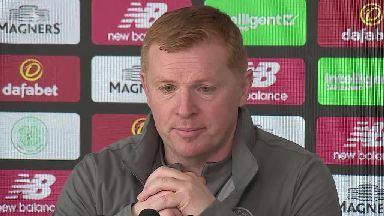 Lennon insisted the club would "vigorously" defend the notice of complaint against Brown. He said: "I just think it is a trumped-up charge. It is something that has been made up. "There is a law out there, from what I can gather, that you can't retrospectively be punished for gestures but it is not even an obscene gesture raising his hands aloft, it has just been concocted. "Scott Brown doesn't have to reproach himself for anything. A feisty fixture saw Rangers striker Alfredo Morelos sent off for elbowing Brown and left-back Andy Halliday shown a second yellow after the final whistle for confronting the Celtic player. Kent has since been handed a two-match ban for lashing out at Brown, while Gerrard will spend one match on the sidelines for comments made to referee Bobby Madden. Celtic and Rangers have both been charged over the post-match scenes.